Mohonk Mountain House is a 19th-century mountain house that has so much history and authenticity it's hard not to fall in love. 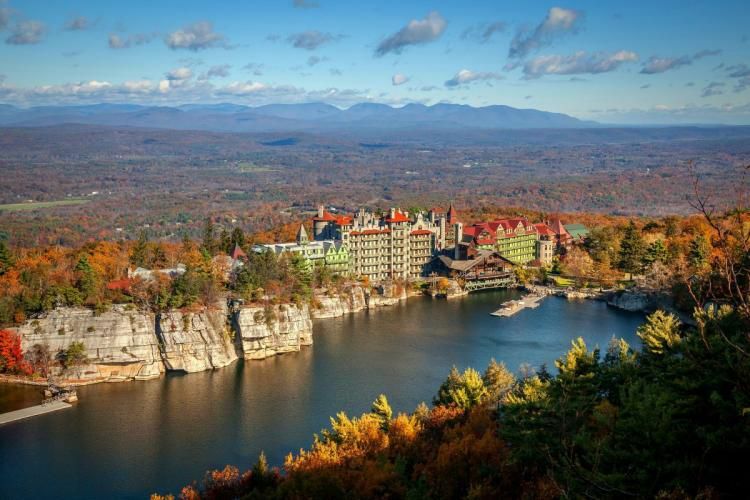 Set on a small mountain-top lake where you can canoe or kayak, Mohonk is known for its hiking trails, family-friendly programs, and historic charm. The spa carries on the Victorian theme and caters to couples. Skana, The Spa at Turning Stone Resort & Casino, Verona, New York, is owned by the Oneida tribe and so the spa menu has an emphasis on Native American traditions. This offers many different types of accommodations, including The Lodge, an all-suite 95-room hotel, the 19-story Tower with 285 rooms, and so on down to an RV park. The Gideon Putnam Resort in Saratoga Springs is a historic property with 22 suites and 120 guest rooms, located right inside the Saratoga Spa State Park. Right next door is the Roosevelt Baths & Spa, where you can take a soak in effervescent mineral water that the area is famous for since the 19th century. (Ask to make sure you get unmixed water.) Saratoga Springs is especially popular in summer when the Saratoga Racetrack and the Saratoga Performing Arts Center are up and running. The park also has an 18-hole golf course. Mirror Lake Inn Resort & Spa has an outstanding view of Mirror Lake and is set right in Lake Placid's only four-diamond resort, located in the heart of the Adirondacks. The clubby 131-room white clapboard and green-shuttered resort has private beachfront on seven acres overlooking Mirror Lake; it staked out the best place for views back in 1926, when it was a just collection of cottages. Every one of the rooms faces the lake and has a view. It's a year-round destination, with winter sports that include dogsled rides. Whiteface Lodge has a “Great Camp" feeling and has proven popular with weddings, groups, and families. The accommodations range from junior suites to one, two and three-bedroom suites, all 94 equipped with kitchens, dining room tables, washer-dryers, bathrooms with jet-tubs and outdoor porches. But a couple looking for a romantic getaway or group of spa-loving girls can seek refuge in the 8,000 square-foot Adirondack-style spa on the lower floors of the resort. The Sagamore dates to 1883 when an inn was first built on a private 70-acre island on Lake George, a historic vacation destination at the southern Adirondacks. A seasonal, family-friendly resort with a championship golf course, The Sagamore has splendid views of the mountains and a modest spa and salon with a full range of treatments. Enjoy indoor and outdoor pools, a private beach, jogger's trails, with nearby hiking, biking, white water rafting, and horseback riding. Spa Mirbeau is located just outside Skeneateles, the historic town at the northern tip of Lake Skeneateles, in the Finger Lakes Wine Country. It strongly evokes a French country inn, berets and all, and manages to pull it off. It is known for being a very romantic spa option. The Copperhood Inn & Spa is a small, intimate destination spa that reflects the European sensibility of its owner, Elizabeth Winograd Iwinski. Set on the Esopus Creek near Shandaken, New York, it has beautiful views of the northern Catskills from its back deck. It's also big with the juicing crowd. Emerson Resort & Spa is just a few hours from New York City in the northern Catskills, right on the Esopus Creek near Mt. Tremper. The Emerson is an adults-only environment with 26 luxury suites decorated in an exotic Indian style, and a spa that carries through the theme. If you have kids, you can stay at the family-friendly Lodge next door. Set near the furthest tip of Long Island, Gurney's is a Montauk institution, with a five-star beachfront location and the closest thing America has to a thalassotherapy spa. The public spaces and spa are a little dated, but the rooms have been redone in a nice beach style. The Spa at Mandarin Oriental, New York is a luxurious, romantic urban hotel spa on the 35th floor of the Time Warner center on Central Park at Columbus Circle. Fabulous shopping and the world's best chefs are just an elevator ride away. Other luxury hotel spas in New York City include The Spa at The Peninsula, La Prairie at The Ritz-Carlton, and Vinotherapie Spa at The Plaza. And there's always Lenox, Massachusetts–a relatively easy trip from New York City and rich in spas, including Canyon Ranch Lenox, Cranwell Resort, Spa and Golf Club and the Kripalu Center for Yoga and Health.